Russia’s economy might be completely imploding, but good strongmen always find new and potentially terrifying ways of distracting from all that. One of those ways is, of course, ramping up military activity that freaks everyone out. In line with that, Russian submarines are hunting the seas at Cold War levels, Syrian bombing campaigns are at such a clip as to be testing the limits of jet engines, and it turns out that the Russian Air Force simulated a nuclear attack on Sweden. 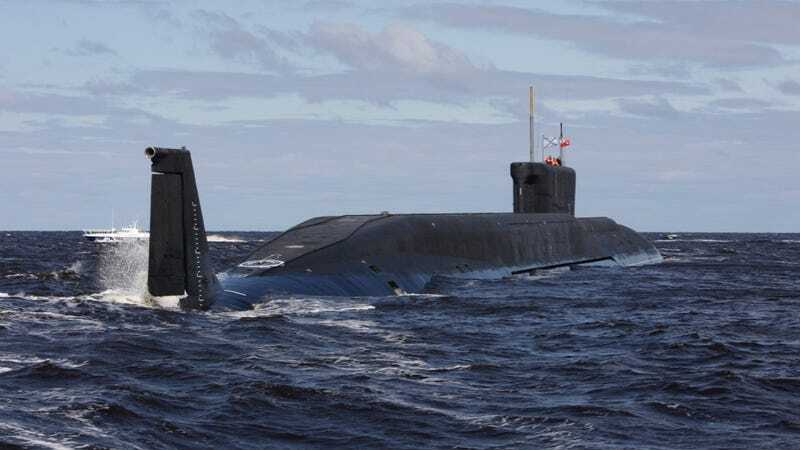 The Russian submarine fleet has returned to the North Atlantic with such gusto that NATO sub commanders are reporting “more activity from Russian submarines than we’ve seen since the days of the Cold War,” according to a top NATO admiral. The photos also show ten Sukhoi Su-25, a lighter jet, seven advanced Sukhoi Su-35 fighter jets, and four advanced interception and attack Sukhoi Su-30 aircraft. Additional aircraft were likely out on aerial strikes while the satellite photos were taken. “You can still see evidence of the vast number of attack sorties at the maintenance structures set up in the field, where Sukhoi Su-24 aircraft are going through repairs and engine replacement due to wear caused by the planes’ high level of activities in the Syrian airspace,” [head of the Fisher Institute’s missile research division Tal] Inbar added. The arrival of the Su-35, Russia’s most advanced front-line fighter, in Syria is especially interesting, considering its primary focus on air-to-air combat, complete with thrust-vectoring engines like the American F-22 Raptor and advanced avionics. In fairness, the United States used to do that sort of thing to antagonize Russia fairly often during the Cold War. An Estonian armored personnel carrier fires blanks from a machine gun during a 2015 exercise. But it’s not like a recent RAND Corporation study showed that Russian forces would completely overrun Latvia, Lithuania, and Estonia in less than three days, or like Saudi Arabia has signaled its willingness to follow Russia’s lead, and pour ground troops into Syria, thus turning up the international flavor of the conflict even more. Actually, all of those things are happening. But hey, at least the price of oil is supposed to stay cheap. For a little while.